Bacon, bacon, bacon, bacon, for years everyone has been obsessed with bacon. The craze reached a fever pitch somewhere around 2010/11 and while every expert has predicted [hoped for] its demise ever since our addiction to bacon seems to give no hint of waning. 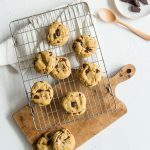 Not only are there stacks of savory recipes out there but you can find hundreds of festivals in celebration of it and websites devoted to its existence. Then, as is always the case with any trend, bacon made its way into desserts. You can’t argue with sweet and savory as an enticing combo, but when fast food joints jump on the bacon dessert bandwagon one has to ask if it has gone to far. But what about those of us who aren’t carnivores? How much have we been missing out on? 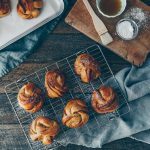 I’ve always said that if I ever start eating meat again, sausage and bacon are some of the first things I’d go for – they just smell so good – but in the meantime my diet has been severely lacking in bacon-y goodness. Sure you can get faux soy bacon but really… no, just no. We never much had bacon growing up but I do fondly recall occasional BLT nights. 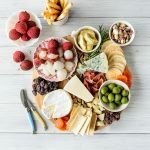 It was one of the easiest meals ever for mom to make – not that there is anything wrong with that – and we got to help. I always liked mine extra crispy, and while bacon cupcakes and bacon doughnuts and bacon toffee sound intriguing, a good BLT is one of the things I’ve missed most. On our last trip we spent some time with my brother and his little family in Philly. 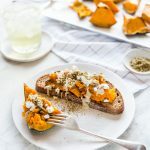 They went meat-free a few years back and have worked their way through most of the vegan restaurants in the city. When he mentioned Shiitake Bacon to me I had the same slightly stunned look on my face that I’ve witnessed each time I’ve described it to people since. When we got back from our holiday it was one of the first things I tried. So a quick commercial break for an interjection of science… not really science, just some info, science makes it sound official. Both types of mushrooms in the pic below are shiitake. Yep, really. For all the brief intensive searching I did, the best thing I could find was this post over here. 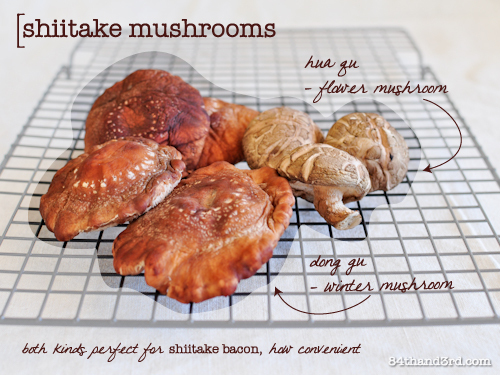 Turns out that shiitake mushrooms – Xiang Gu or fragrant mushroom – come in two different forms. Dong Gu or winter mushroom is the smooth one that looks almost velvety. Hua Gu or flower mushroom has a more button mushroom shape and a cracked pattern. Either will work a treat for this recipe. Also if you haven’t worked it out yet, Gu=Mushroom. Science and language all in one, it’s like a virtual cultural exchange round these parts – ha! Now I can’t attest – yet – to how Shiitake Bacon would work in desserts, but used on a sandwich with lettuce and tomato for lunch, served with eggs for brunch, or topping a Vegan Mushroom & Lentil Burger for dinner it is stunning. Tell me, have you ever made any crazy bacon creations? Bacon, bacon, bacon, for years everyone has been obsessed with bacon. Since I ceased eating meat my diet has been severely lacking in bacon-y goodness but something magical happens when you bake slices of shiitake with oil and salt. Bacon is back on the menu, you have no idea how happy this makes me. Preheat oven to 160C [320F]. 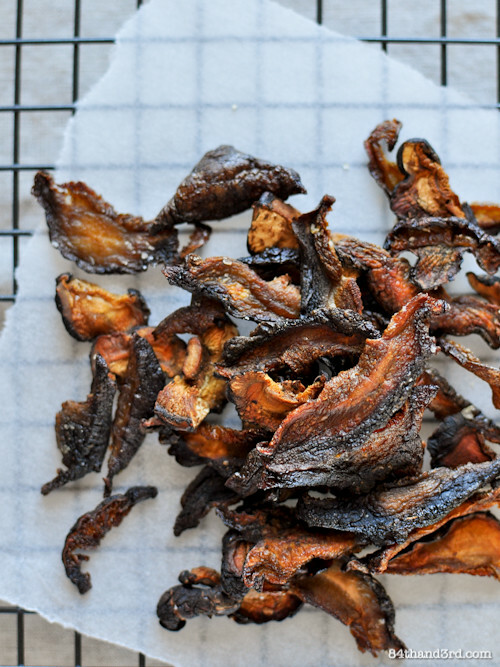 Wipe mushrooms clean with a damp paper towel and trim stems. Place a piece of paper towel over a cooling rack. Slice mushrooms a minimum of 5-7 mm thick*. Any thinner and they will nearly disintegrate when baked. Drizzle the oil over a non-stick baking sheet and rub it around with your hand to create a thin layer. Arrange slices in a single layer on the oiled tray then flip so both sides have a bit of oil on them*. Sprinkle the salt over the slices. Bake in preheated oven for 10 mins. Use tongs to flip each slice, dipping through the oil on the tray if they look a bit dry – yes, this is slightly tedious, yes it is necessary. Return to oven and bake for 5 mins, check and flip again. Bake for a further 5 mins, check and remove any that look crunchy and place on the prepared cooling rack. They will not be very crunchy out of the oven but will crisp up on cooling, if they don’t just return them to the oven. At this point keep baking and checking every 2 minutes, removing those that are done each time*. Hot Tip: Store in fridge wrapped in a paper towel and tucked into a baggie. To re-crisp simply drop into a dry skillet over medium heat and cook for 2 mins or so, shaking pan every now and then. Cool and eat. Oil: Mushrooms should not drenched in oil, you need much less than you think, but a spot or two on each is important. Magic will happen in the oven. Thickness: So the first time I made this the mushrooms had been sitting in the fridge for a bit too long and they were a touch dry – this actually worked in my favour however and 5mm slices were perfect. If using fresh mushrooms slice them a bit thicker, around 7mm, as they have more moisture to lose as they cook. Cooking time: The total time will depend on the thickness of the slices and how fresh, or not fresh, the mushrooms are. Just keep an eye on them! The savory, shattery crunch of a good BLT is one of the things I’ve missed most about not eating meat. This version, using shiitake bacon, isn’t missing a single thing. I have never made any crazy bacon creations, but I just want to say that after spending so much time in the USA, hubby now much prefers the crispy crunchy bacon the Americans do, as sopposed to the soggy limp stuff we get served here. I agree! I make my own UK style streaky bacon which actually goes crispy when you cook it! 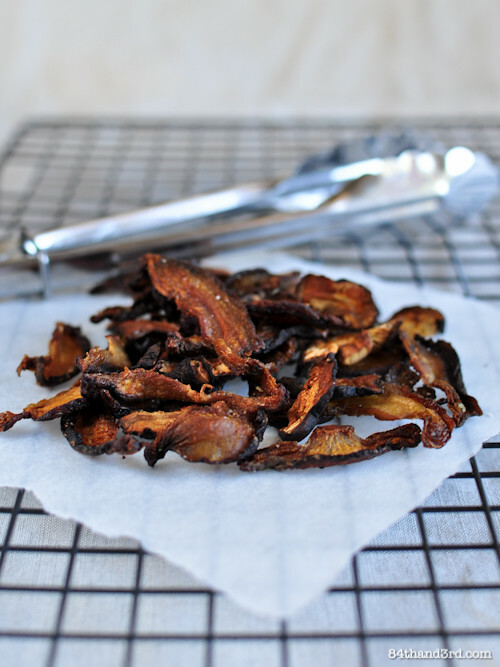 As for Mushroom bacon, it’s a great idea, if you don’t eat meat! And the photo of the BLT is just gorgeous! OMGGG this is AMAZING JJ! Thank you so much for posting it 😀 Can’t wait to try it!! Wow wow wow! Cannot wait to try this at home!! So much fun!!! Have no shiitakes at home, but brought a whole tray of Portobellos at the markets yesterday!! So guess what! I’m game 🙂 ! I do wonder if it works with any other mushrooms but haven’t tried… would love to hear how it goes! How very intriguing JJ! I saw fresh shiitake mushrooms at the markets on Sunday and the lovely mushroom man gave me some to try for free. If only I didn’t use them all in last night’s stir fry. Oh well will just have to buy more this weekend! I used my leftover ones to stir fry with garlic – drool! Glad I found your description it was bugging me as to why they looked so different! Love this! 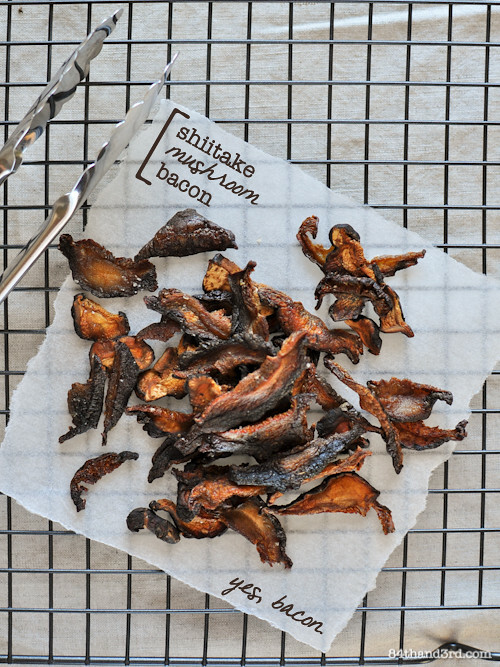 I don’t like bacon at all but I love shiitakes – this is my kind of bacon! Ooh I love this! I am not sure if it will completely lure me away from bacon but it will be a great alternative for when I need to be a little more virtuous. 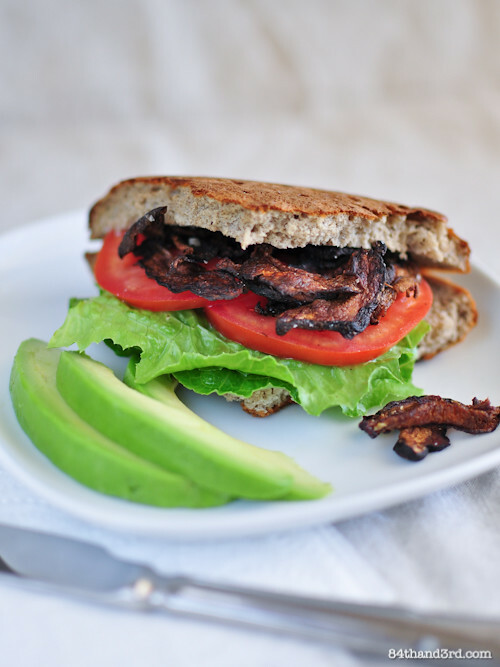 Using shiitake mushrooms for a BLT is tasty, healthy and genius! 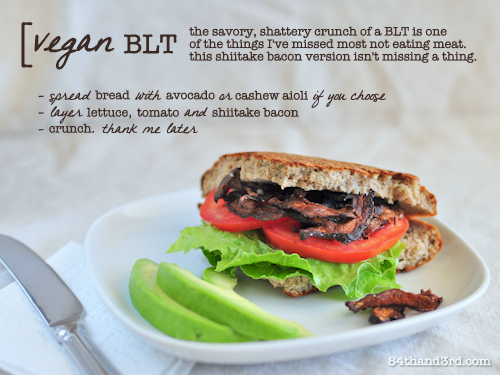 Your BLT looks wonderful and it’s exactly what I want for lunch tomorrow! I was thinking that this idea would be a bit more ‘authentic’ per a bacon flavor, do now you have one, I have to try it. Now THIS is my kind of bacon! I can’t wait to try it out on my next BLT 🙂 This summer, my boyfriend fell in love with the deep-fried, chocolate covered bacon at the fair. I nearly gagged. Thanks for sharing!! I’m so glad to hear you avoid soy bacon! This is very intriguing…and fascinating! JJ, you are always a great source of inspiration and experimentation! Love it! Yummm…sounds delicious. Will try it as soon as I can get a real farm grown tomato…probably July. Yep, I sure do have some crazy bacon creations! Most of mine revolve around soy sauce/liquid smoke marinades. I’ve used it on tempeh, tofu and even flaked coconut, but never mushrooms. I’ll be keeping that in mind.